Do you have a tree that looks like this? With invasive winter creeper (euonymus fortunei) crawling up the trunk, where it will then flower and reproduce? 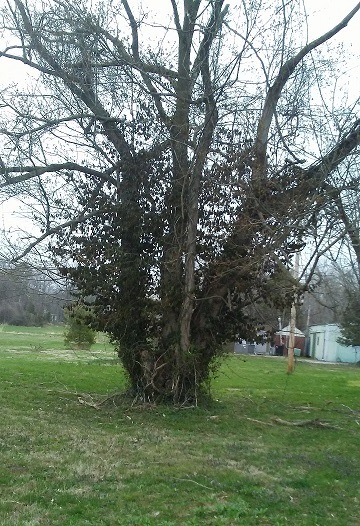 If you want to protect that tree, the vine should be cut at the base of the tree and possibly torn out by the roots (the vine on the bark will die and fall off). Keep Carbondale Beautiful is partnering with the College of Agricultural Student Advisory Council. We will be working in the community on Thursday, April 11, to help as many trees as we can. Get on the list by contacting KCB at keepcb1326@gmail.com or 618-525-5525. Provide address, and name and phone number of home-owner or person in authority who is giving permission. The Agricultural Student Advisory Council (Ag Council) is the student government organization for the College of Agricultural Sciences. Ag Council is composed of representatives from each club in the College and works in conjunction with the College administration, registered student organizations, and students to sponsor college-wide activities. About Keep Carbondale Beautiful, Inc.
Keep Carbondale Beautiful has been cleaning up litter, promoting waste reduction and beautification, and educating the public since 1987. Hundreds of volunteers participate each year in events that create changes in attitudes and behavior. For more information, visit keepcb.org, like us on facebook.com/KeepCarbondaleBeautiful, and follow us @keepcb on Twitter.